Advantages: Process of building well described; very high standard of modelling; plenty of photographs; interesting and varied projects; useful techniques; good list of reference books; includes colour chart. Osprey Publishing’s lasted addition to their ever expanding Modelling Series covers the renowned North American Aviation’s P-51 Mustang. Personally, I was pleased when I heard that Osprey was going to include the P-51 in this series; and I was equally pleased when I finally got my hands on the book. 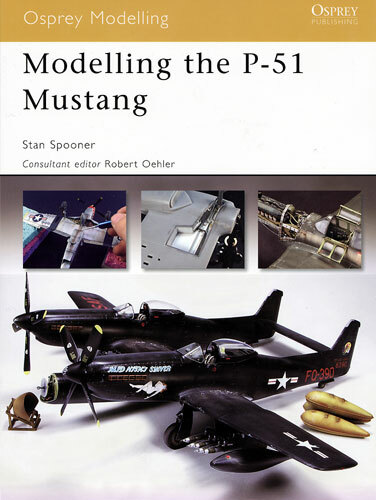 This title differs a little from the layout of other Osprey Modeling books in that the reader is treated to a series of different kits with the chapters starting from close to out of the box builds and progressing through “adding details” ones and culminating in a down right difficult one. It starts off running and ends up sprinting! The book comprises of 82 glossy pages measuring 243mm x 185mm between cardboard covers and is well illustrated with 228 colour photographs of the models being built. · Building a Well-Worn P-51A. 1/48 scale Accurate Miniatures kit with the addition of a True Details cockpit set, a Verlinden engine, Ultracast propeller blades, Cutting Edge gun sight, Eduard brass photo etch and the detailing of the kit’s undercarriage parts as well as ordnance pylons. · British Shark. 1/48 scale Tamiya P-51B in 112 Squadron RAF markings with Aires gun bays, Ultracast propeller, spinner, flaps, rudder, elevators bombs, and exhaust stacks, Obscuroco wheels, Jaguar resin interior, Eduard colour photo-etch placards, seat harness and instrument panel. · Creating a 357th Fighter Group P-51D. 1/48 Scale Tamiya P-51D using True Details seat, Obscuroco wheels, Ultracast spinner, Cutting Edge gun sight, Eduard colour photo etch placards and teknics drop tanks. This build also deals with removing the kit’s dorsal strake to depict an early build P-51D. · Building a Korean War F-51D. 1/48 scale Tamiya kit using Obscuroco wheels, Ultracast exhaust stacks, spinner and propeller blades, Aires wheel well, Eduard colour photo etch placards, seat harness, instrument panel and tailwheel doors, Verlinden rockets and napalm tanks. This build also uses alclad and Testors Model Master Metalizer paints. · The final chapter deals with the build of the Modelcraft 1/48 scale F-82G. Although not a true P-51 by definition, the F-82 is commonly looked upon as a “twin Mustang” and as such, at home in this book. If you have never seen this kit before then you are in for a treat in the way that Stan Spooner courageously deals with it to bring it right up to modern day accepted standards. 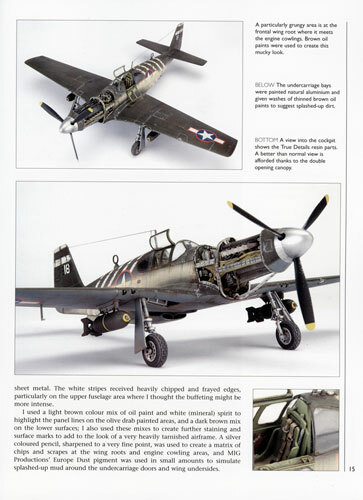 A full spectrum of after-market products are used enhancing a great deal of old fashioned modeling skills such as boxing in and detailing wheel wells, dropping flaps and elevators, creating undercarriage legs and scratch building cockpit interiors. Minuses? I was surprised that there were no builds in other than 1/48 scale. I was expecting that the Dragon 1/32 scale kit would feature as well as the Trumpeter 1/24 scale one but in fairness, the book may have been written before they (or at least the Dragon one) had been released to the market. In summary, this is a very nice little parcel indeed. It is well written with easy to understand descriptions of finicky work and is very well illustrated.